the UGC: The Bandwagon, or Maybe I Should Say "Truck-wagon"
The Bandwagon, or Maybe I Should Say "Truck-wagon"
Unless you've been hiding under a rock, you probably know that food trucks have been the hot new thing for a little while now. I've definitely been aware of them, and as often as I've thought about trying to track one down, I hadn't managed to make an effort. Until one practically showed up at my doorstep. I happen to work in a fairly business heavy neighborhood, and a couple of the food trucks have figured out that this might not be a bad place to hang around since there aren't that many other food options. So I've now got pretty regular access to not just one, but TWO trucks! One is BBQ Kalbi, which serves up a variety of korean style meats in burritos, tacos or a rice plate (meat, salad, rice). I'm kind of in love with the beef plate. It's flavorful with just a hint of spice, and it's even better if you add one of their mango sauces. 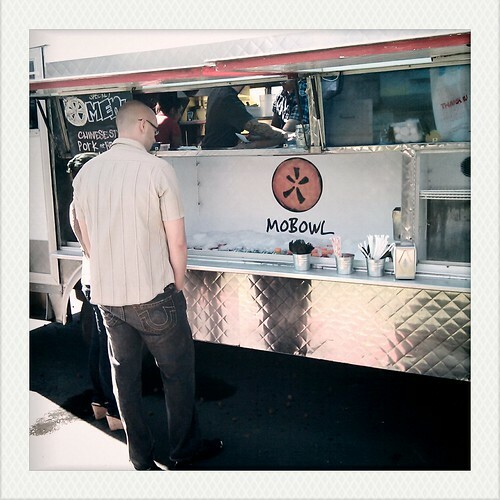 However, my favorite food truck has to be MoBowl. If you follow me on twitter, you've probably seen me blather on about them. I can't help it. 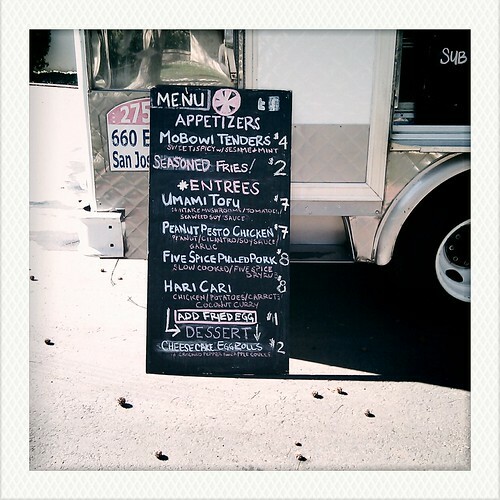 The folks running the truck are super nice, and the food is awesome. 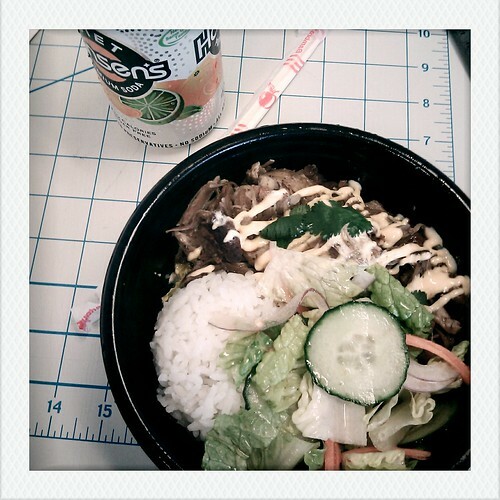 I've heard that pretty much all of the bowls are good, but I can't stop myself from ordering the same thing every time: the five spice pulled pork bowl. Full of flavor and pork that practically falls apart. As much as I want to try the other varieties, I just can't do it. I also have a hard time not ordering the cheesecake egg rolls. Now, these aren't just your average fried cream cheese dessert. Oh no. This is actual cheesecake encased in a golden fried egg roll wrapper. And then there's the pineapple black pepper dipping sauce. SO GOOD. Both trucks are on twitter and post their schedules on their website. If you're ever in the area, give them a try. They're both worth seeking out. The Bandwagon, or Maybe I Should Say \"Truck-wagon\"